Boston Estonian School Singers: Hendrik Branzetti, Enrik Attemann, Norah Kaps, Amelia Talluri, Isabella Branzetti, Rajit Talluri, Mikk Beckles. The successful three-day Baltic Centennial in Boston November 23-25 weekend was a feast for eyes and ears! Hundreds of enthusiastic guests enjoyed a weekend packed with music and dance performances, film screenings, honorary speakers, panel discussions, art exhibits, marketplace, a grand gala banquet, and an ecumenical church service. 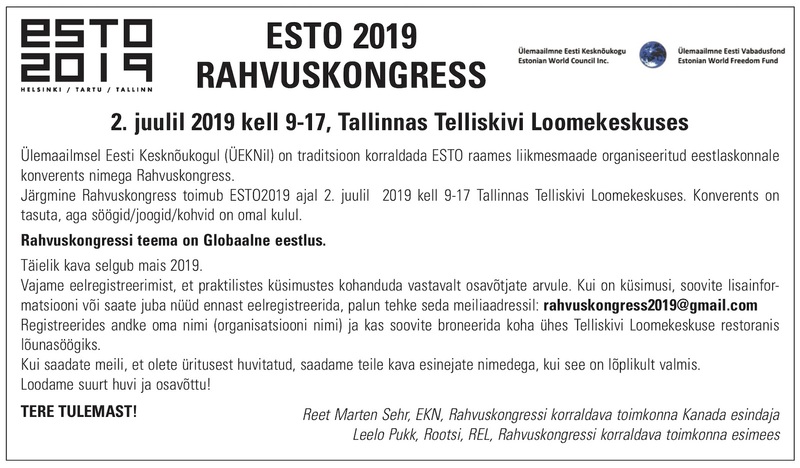 A small group of dedicated volunteers from the Estonian, Latvian and Lithuanian communities worked for three years to provide a weekend of outstanding activities highlighting our proud heritage. A celebratory large audience welcomed Estonian pianist Hando Nahkur, the North American Latvian Quartet and the St. Christopher Chamber Orchestra from Vilnius, Lithuania to the opening concert at Boston's famous Symphony Hall. 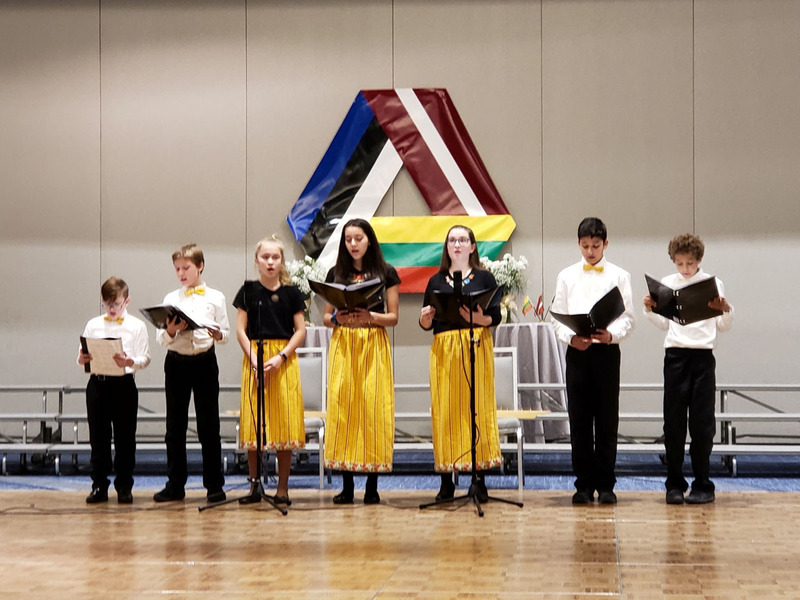 The Marriott Copley ballroom was filled to capacity with a festive crowd, singing and clapping to the performances of hundreds of choir singers and folk dancers from Estonia, Latvia and Lithuania. Estonia was proudly represented by seven young singers from the Boston Estonian School who sang and played the traditional zither. The Lexington High School choruses, numbering around 80, performed Estonian songs, including Ilus Maa, accompanied on the piano with Epp Sonin. With all the hundreds of performers on stage for a grand finale, the concert ended with a rousing rendition of songs from all three countries and a spontaneous Baltic Chain — the audience joining hands together around the periphery of the huge ballroom. The Art Exhibit showcased the works of over 40 Baltic artists in paintings, ceramics, sculture, photography and fiber arts. Among these were Ivo Lill, Iris Kivisalu, Kateriin Rikken, Epp Ojamaa, Anne Pärtna, Eleri Ever, Kristiana Pärn, Kristiana Pärn, Lynne Klemmer, Sergei Isupov, Kadri Pärnamets, Uno Habakukk, Kristina Paabus, Rauno Olev Jõks, Helga Roht Poznanski, and Marjut Karu Nousiainen. In addition, Liina Langi, professional lace knitter from Estonia, demonstrated the techniques of this traditional and unique handcraft. The Speaker Series featured the cultural and historical side of the Baltics. The panel discussion of the eight filmmakers was lead by TV personality Joyce Kulhawik. Estonians on the panel were Helga Merits for "Coming Home Soon – The Refugee Children of Geislingen" and Terje Toomistu for "Soviet Hippies." This was followed by the panel, "The Baltic Experience: Memoirs and Memories" moderated by Estonian Marilem Ferentinos. Representing the Estonian side on the panel was the well-known photojournalist Priit Vesilind and also the filmmaker Helga Merits. The Speaker Series touched on the economic and political side. Economics Nobel Laureate Robert Shiller spoke about discovering his Lithuanian roots and "The American Dream and the European Dream." 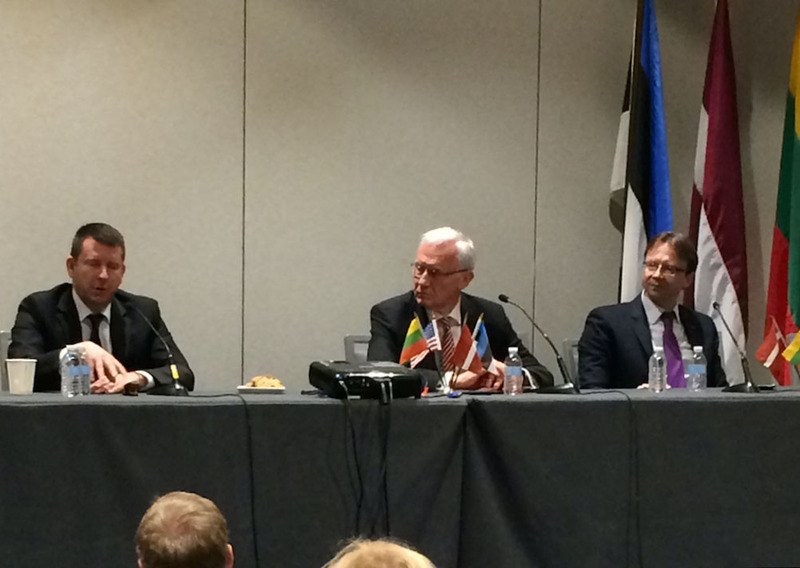 The panel discussion "Meet the Baltic Ambassadors" was very well attended and chaired by Karl Altau, Managing Direcor of JBANC. The new Estonian ambassador Jonatan Vseviov, eloquent and knowledgeable, was very well received. Unfortunately the keynote speaker, Paul Goble was not able to participate and Rita Peters, his longtime friend and colleague, read his speech, "The Baltic Miracle: Why It Happened, Why It Is Threatened, and Why It Will Win Out." Simultaneously the Baltic Film Festival was occurring at the nearby historic Paramount Theater now part of Emerson College. The Estonian films that were screened during the three days were Tangerines, Soviet Hippies, November and Coming Home Soon – The Refugee Children of Geislingen." Reverand Uudo Tari participated in the Ecumenical Service at the Lithuanian Catholic Church in South Boston where Epp Sonin sang "Palve" by Leo Virkhaus and "Helde Isa" and the Boston Estonian School students, Isabella and Hendrik Branzetti, read passages from the Bible. On the same afternoon Mart Ojamaa, Andrew Ferentinos, Epp Sonin and Anne-Reet Annunziata met at twilight at the amazing traveling exhibit, "Masters of Our Own Homes: Estonia at 100", for a farewell ceremony. The exhibit pavilion with light installations is 39 feet long and 12 feet high. It is compiled of 244 panels, each one telling a small part of Estonia's colorful and exciting history as well as featuring highlights of present-day Estonia. 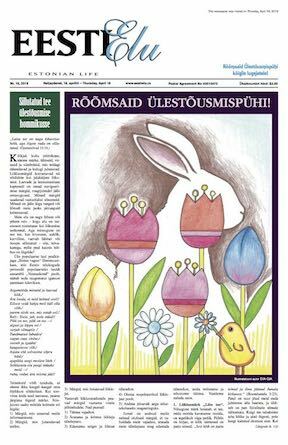 The exhibit was created by Estonians living at home and abroad. Students, businesses, a number of Estonian photographers including Annika Haasi, Birgit Püve, and Triin Kerge as well as many Estonian museums contributed to the completion of the exhibit. They recorded a story of Estonia that they wish to share with the world to celebrate Estonia's birthday. The exhibit was created by Vabamu Museum of Occupations and Freedom with the support of the Republic of Estonia Government Ofﬁce Estonia 100 program, and in collaboration with the Stanford University Library, the Washington Estonian Embassy, and the Estonian Studies Centre/VEMU: Museum of Estonians Abroad. Support for the installation in Boston came from Andrew Prozes, Mart Ojamaa, ZVI Construction Co. LLC, Boston Estonian Society Inc., Estonian Honorary Consulate in Boston, Estonian American National Council, Inc., and the Baltic American Society of New England, Inc.
Much credit has to be given to our team: Karin Värnik-Barrett for the vision; Anastassia Kolde for creating the Estonian sections for Art, Film and Marketplace — and applying for grants; Anne-Reet Annunziata, our Honorary Consul for being the diplomat; Epp Sonin for her financial support, connections and expertise; Mart Ojamaa for shouldering the Traveling Exhibit; Nele Kaps for designing the original website; and Marilem Ferentinos for keeping Estonia's presence in the event.